Conny’s lampshade hat lit up orange whenever he had a bright idea. 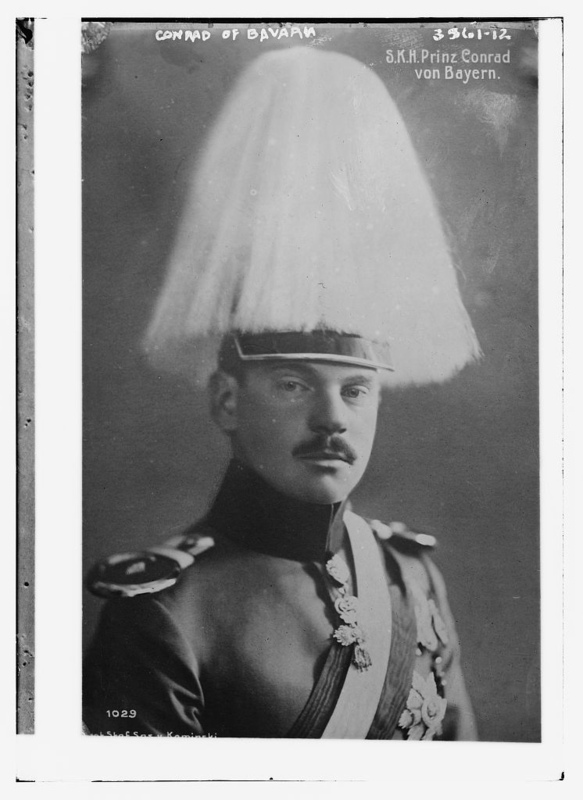 Conrad of Bavaria, ca.1910-1915. Library of Congress. A Mind is a Terrible Thing to Waste. The wife accused me of tossing out the leftovers when I’d cleaned the kitchen the other night. They’re in the fridge, I said, you just haven’t looked hard enough. But no, they were not in the fridge. Impossible, I said, I remember very clearly taking the glass container from the cupboard, putting the rest of the curried chicken inside, sealing it closed …and putting it right back into the cupboard again, where, thank God, it’s still safe. What Dreams May Come, Barefoot and in a Bathrobe. It was a chilly morning. On the platform below, just as my commuter train was pulling away, I saw a man in a plaid bathrobe. He was maybe fifty years old, graying, barefoot, but otherwise well-groomed. He didn’t appear to be homeless. He walked ten quick paces, stopped, and lifted up the hem of his robe. He reached down toward his wiggling toes in slow-motion disbelief. Only then did he realize it wasn’t a dream. Vengeance is Mine, Saith the Squid. I was eating lunch at the local Japanese ramen shop, lifting a spoonful of precious broth to my lips. Just then, from the next room, came a colossal crash. Someone had dropped a bank safe, a quarter-ton barbell, or the frozen corpse of a rhino, and the whole room shook. The broth, in which drops of squid ink were suspended, splattered across my shirt. From beyond the grave, the bitter cephalopod had taken its revenge. The abnormal expression of mirth is shown in clownishness, levity, and caricaturing of persons… When excessive it can be restrained by devoting more time to serious and practical principles of science. If deficient it can be cultivated through the study of wit and humor. The arch-phrenologist Johann Spurzheim located mirthfulness in a particular corner of the forehead where, he said, Voltaire, Rabelais and Sterne each showed a considerable bulge. It’s a little known fact that all three were solemn and severe children who only developed a sense of humor after years of study. “I felt no trace whatever of fear; it was pure delight and welcome.” William James, on the infamous morning of April 18, 1906, woke to a real earthquake, his first. He was visiting Stanford University, thirty miles below San Francisco. A number of the brick dormitories and other campus buildings collapsed, though James was unharmed. Fascinated, he traveled into the city where he spent all day touring the rubble and watching the progress of the fire. There are, of course, various philosophical approaches to suffering. One is to suggest that suffering is the basic condition of existence and the lack of it only a brief anomaly. Another is to see in suffering something which may contribute toward a higher good, in this world or the next. Yet another is to deny that suffering is real at all. It’s tempting, but wrong, to read this last view into James and Montaigne. They don’t mean to suggest that suffering is illusion, only that we are wrong to imagine we always understand or recognize it. Human beings have no monopoly on suffering and death. All living things die, and most, it seems, are capable of suffering to one degree or another. How many trillions of creatures were starved, maimed, crushed, tortured, devoured, or killed by disease before our ancestors ever came down from the trees? Some people find the idea of a life founded on these conditions intolerable and so they choose to believe in a primordial state without disease or violence, and a historic fall from that condition to our present one. They feel that suffering and death prove a sort of satanic disruption in the cosmos. If it didn’t require us for its survival, science would do just fine. Instead, it’s like a telescope mounted on top of a swaying tree. There’s something almost endearing in how easily we admit the errors of former times while insisting on our own enlightened certainties. We like to mistake the advancement of science and technology for moral progress. The first inventor of the wheel probably thought he could never be wrong about anything ever again. It shocked Albert to learn that, in fact, most people did not see any spots at all. 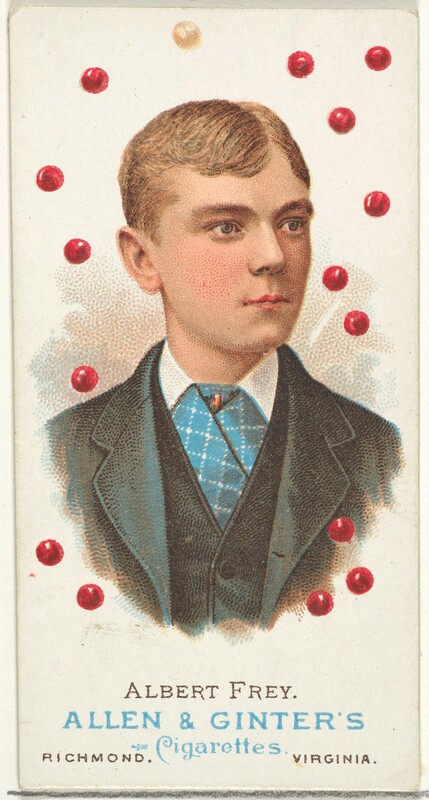 Allen and Ginter Co. cigarette trading card depicting Albert Frey (billiards) for the World’s Champions series (1887).